The judges had a very hard job selecting the overall winner of the Cambridge Young Musician of the Year competition, with standards exceptionally high. Judges Stephen Nagy and Gillian Thoday finally selected singer George Eddy to be the Cambridge Young Musician of the Year 2008. George, 18, comes from March and formerly attended Kings School, Ely. He was awarded a prize of £250 and was invited to perform at a concert with an orchestra at West Road Concert Hall, Cambridge on Sunday 11 May, when winning entries in the Cambridge Young Composer of the Year will also be performed. The winner of the 13-15 age group was percussionist Lucy Landymore. The winner of the 10-12 age group was cellist Victoria Nicoll. The Connie and John Suter Prize for the most promising finalist who was not an age group winner was Emma Fowler. Judge Gillian Thoday said: "I was extremely impressed with the overall standard - it is clear that young musicians in the Cambridge area are being fostered by expert hands." A full list of Class Winners and Highly Commended winners in the competition can be found here. 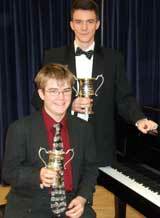 The next Cambridge Young Musician of the Year Competition will be held in 2010 with details announced in 2009.